alaTest a collecté et analysé 57 avis de consommateurs et d'experts pour le produit Gaggia Cubika. La note moyenne du produit est 3.7 sur 5, tandis que les autres produits de même catégorie ont une note moyenne de 4.2 sur 5. Les testeurs apprécient l'ergonomie. Le design impressionne, mais les testeurs sont moins positifs sur le bruit. 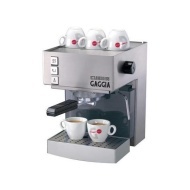 Après analyse des notes de consommateurs et d'experts, de l'âge du produit ainsi que d'autres facteurs, et comparé aux autres produits de même catégorie, le Gaggia Cubika obtient un alaScore™ de 79/100 = Bien. First class easy to use machine making first class espresso. We use Lavazza and Illy, both providing excellent balanced coffees. Can't think what more anyone would want. Highly recommended. From the very first use of this machine, I find the coffee very bitter. Whatever I have done since, like selecting different blends of coffee, flushing, tamping, have not helped at all. Makes great coffee and easy to use (once I'd worked out how to clear the air lock when the machine is first switched on - it does tell you in the instructions but, hey, I'm a man so I wasn't going to read those straight away, was I?)! easy to use, looks incredibly cute on the worktop.